Dr. Wang joined PNNL in 1994 and was promoted to Laboratory Fellow in 2005. He led the Catalysis and Reaction Engineering Team from 2000 to 2007, and has served as the Associate Director of the Institute for Integrated Catalysis since 2008. In 2009, Dr. Wang assumed a joint position at Washington State University and PNNL. In this unique position, he continues to be a Laboratory Fellow and associate director of IIC at PNNL and is the Voiland Distinguished Professor in Chemical Engineering at WSU, an endowed full professorship with tenure. Dr. Wang is best known for his leadership in the development of novel catalytic materials and reaction engineering for the conversion of fossil and biomass feedstocks to fuels and chemicals. Dr. Wang has authored >280 peer reviewed publications in lead scientific journals including Science, Nature group journals, J.Am.Chem.Soc, Angewandt Chemie, Energy and Env. Sci., ACS Catalysis, Journal of Catalysis with H index=70 and >20,000 citations, co-edited 2 books and 5 special journal issues, and given more than 150 invited presentations. He is the inventor on > 270 issued patents including 108 issued U.S. patents (>90% of his patents are licensed to industries). His discoveries in microchannel reaction technologies led to the formation of Velocys, trading under the London Stock Exchange (VLS). He is a fellow of NAI (National Academy of Inventors), a member of WSAS (Washington State Academy of Science), and a fellow of 4 major professional societies: AIChE (American Institute of Chemical Engineers), ACS (American Society of Chemistry), RSC (Royal Society of Chemistry), and AAAS (American Association of the Advancement of Science). 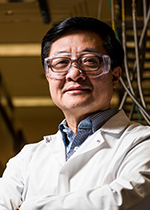 He has won numerous awards including 2017 American Chemical Society I&EC Division Fellow Award, 2006 Asian American Engineer of the Year Award, Presidential Green Chemistry Award, 3 R&D 100 Awards, Distinguished Alumni Achievement Award from Chemical Engineering at WSU, 2 PNNL Inventor of the Year Awards, Battelle Distinguished Inventor Award, and the first recipient of PNNL Laboratory Director's Award for Exceptional Scientific Achievement Award. He is the past chair of the Energy & Fuel Division of the American Chemical Society, and currently serves editorial board of 7 catalysis and energy related journals including ACS Catalysis and Catalysis Today. Honorary Chairman of Trends in Renewable Energy (Future Energy Service and Publishing), (2015-present). Director to the Catalysis and Reaction Engineering Division of AIChE (2015-2017). U.S. Patent No. 9,452,402, September 27, 2016, "INTEGRATED REACTORS, METHODS OF MAKING SAME, AND METHODS OF CONDUCTING SIMULTANEOUS EXOTHERMIC AND ENDOTHERMIC REACTIONS ". U.S. Patent No. 9,289,741, March 22, 2016, "Suspended-Slurry Reactor". U.S. Patent No. 8,957,259, February 17, 2015, "Dimethyl Ether Production from Methanol and/or Syngas". U.S. Patent No. 8,557,186, October 15, 2013, "Integrated Reactors, Methods of Making Same, and Methods of Conducting Simultaneous Exothermic and Endothermic Reactions ". U.S. Patent No. 8,101,140, January 24, 2012, "Structured Catalyst Bed and Method for conversion of Feed Materials to Chemical Products and Liquid Fuels". U.S. Patent No. 7,858,667, December 28, 2010, "Alcohol Synthesis from CO or CO2 ". U.S. Patent No. 7,498,001, March 3, 2009, "Catalyst, Method of Making, and Reactions Using the Catalyst ". U.S. Patent No. 7,435,760, October 14, 2008, "Method of Generating Hydrocarbon Reagents from Diesel, Natural Gas and other Logistical Fuels". U.S. Patent No. 7,011,760, March 14, 2006, "Carbon Nanotube-Containing Structures, Methods of Making, and Processes Using Same (Incorp.12744-E, 12647-E, and E-1811) ". U.S. Patent No. 6,750,258, June 15, 2004, "Catalyst Structure And Method Of Fischer-Tropsch Sythesis* (DIV of 12198-E C1 which is a CIP of B-1484) ". U.S. Patent No. 6,706,893, March 16, 2004, "Methods of Making Pyrrolidones ". U.S. Patent No. 6,670,300, December 30, 2003, "Textured Catalysts, Methods of Making Textured Catalysts, and Methods of Catalyzing Reactions Conducted in Hydrothermal Conditions ". U.S. Patent No. 6,670,483, December 30, 2003, "Methods of Making Pyrrolidones ". U.S. Patent No. 6,632,951, October 14, 2003, "Methods of Making Pyrrolidones ". U.S. Patent No. 6,603,021, August 5, 2003, "Methods of Making Pyrrolidones ". U.S. Patent No. 6,570,043, May 27, 2003, "Converting Sugars to Sugar Alcohols by Aqueous Phase Catalytic Hydrogenation ". U.S. Patent No. 6,491,880, December 10, 2002, "Catalyst Structure And Method Of Fischer-Tropsch Sythesis* (CIP of B-1484) ". U.S. Patent No. 6,235,797, May 22, 2001, "Ruthenium on Rutile Catalyst, Catalytic System, and Method for Aqueous Phase Hydrogenations ". Gao F., J. Szanyi, Y. Wang, Y. Wang, C. Peden, K. Howden, and N. Currier, et al. 2016. Final Report of a CRADA Between Pacific Northwest National Laboratory and Cummins, Incorporated (CRADA No.PNNL/283): “Enhanced High and Low Temperature Performance of NOx Reduction Catalyst Materials”. PNNL-25688. Richland, WA: Pacific Northwest National Laboratory. Lebarbier Dagel V.M., J. Li, C.E. Taylor, Y. Wang, R.A. Dagle, C.A. Deshmane, and X. Bao. 2014. Task 3.3: Warm Syngas Cleanup and Catalytic Processes for Syngas Conversion to Fuels Subtask 3: Advanced Syngas Conversion to Fuels. PNNL-23207. Richland, WA: Pacific Northwest National Laboratory. Dagle R.A., V.M. Lebarbier, K.O. Albrecht, J. Li, C.E. Taylor, X. Bao, and Y. Wang. 2013. "Syngas Conversion to Hydrocarbon Fuels through Mixed Alcohol Intermediates." In 23rd North American Catalysis Society Meeting, June 2-7, 2013, Louisville, Kentucky, Paper No. P-M-BRC-147. N/A:North American Catalysis Society. PNNL-SA-92427. Ramasamy K.K., and Y. Wang. 2013. "Catalyst Activity Comparison of Alcohols over Zeolites." Journal of Energy Chemistry 22, no. 1:65-71. PNNL-SA-92939. Ramasamy K.K., and Y. Wang. 2013. "Conversion of Methanol, Ethanol and Propanol over Zeolites." In 23rd North American Catalysis Society Meeting, June 2-7, 2013, Louisville, Kentucky, Paper No. P-Tu-BRC-67. N/A:North American Catalysis Society. PNNL-SA-92019. Ramasamy K.K., and Y. Wang. 2013. "THERMOCHEMICAL CONVERSION OF FERMENTATION-DERIVED OXYGENATES TO FUELS." In Biomass Processing, Conversion and Biorefinery, edited by B Zhang and Y Wang. 289-300. Hauppauge, New York:Nova Publishers. PNNL-SA-92769. Wang H., and Y. Wang. 2013. "BIOMASS TO BIO-OIL BY LIQUEFACTION." In Biomass Processing, Conversion and Biorefinery, edited by B Zhang and Y Wang. 153-166. Huntington, New York:Nova Science Publishers, Inc. PNNL-SA-93389. Wang H., J.L. Male, and Y. Wang. 2013. "Recent advances in hydrotreating of pyrolysis bio-oil and its oxygen-containing model compounds." ACS Catalysis 3, no. 5:1047-1070. PNNL-SA-93343. Lebarbier V., R.A. Dagle, A.K. Datye, and Y. Wang. 2010. "The effect of PdZn particle size on reverse-water-gas-shift reaction." Applied Catalysis. A, General 379, no. 1-2:3-6. PNNL-SA-68800. Holladay J.D., J. Hu, D.L. King, and Y. Wang. 2009. "An Overview of Hydrogen Production Technologies." Catalysis Today 139, no. 4:244-260. PNNL-SA-54171. Hyman M.P., V.M. Lebarbier, Y. Wang, A.K. Datye, and J.M. Vohs. 2009. "A Comparison of the Reactivity of Pd Supported on ZnO(10(1)over-bar0) and ZnO(0001)." Journal of Physical Chemistry C 113, no. 17:7251-7259. PNNL-SA-66002. Liu W., D.L. King, J. Liu, B.R. Johnson, Y. Wang, and Z. Yang. 2009. "Critical Material and Process Issues for CO2 Separation from Coal-Powered Plants." JOM. The Journal of the Minerals, Metals and Materials Society 61, no. 4:36-44. PNNL-SA-58412. She X., M. Flytzani-Stephanopoulos, C.M. Wang, Y. Wang, and C.H. Peden. 2009. "SO2-induced stability of Ag-alumina catalysts in the SCR of NO with methane." Applied Catalysis. B, Environmental 88, no. 1-2:98-105. PNNL-SA-65953. Wang Y., and W. Liu. 2009. "Fischer-Tropsch Synthesis on Ceramic Monolith-Structured Catalysts." Catalysis Today 140, no. 3-3:142-148. PNNL-SA-58569. Gates B.C., G. Huber, C.L. Marshall, P.N. Ross, P.N. Ross, J. Siirola, and J. Siirola, et al. 2008. "Catalysts for Emerging Energy Applications." MRS Bulletin 33, no. 4:429-435. PNNL-SA-59775. Roh H., Y. Wang, and D.L. King. 2008. "Selective Production of H2 from Ethanol at Low Temperatures over Rh/ZrO2-CeO2 Catalysts." Topics in Catalysis 49, no. 1-2:32-37. PNNL-SA-46943. Cao C., D.R. Palo, A.Y. Tonkovich, and Y. Wang. 2007. "Catalyst Screening and Kinetic Studies Using Microchannel Reactors." Catalysis Today 125, no. 1-2:29-33. PNWD-SA-7053. Cao C., J.F. White, Y. Wang, and J.G. Frye. 2007. "Selective Hydrogenolysis of Sugar Alcohols Over Stuctured Catalysts." In Catalysis of Organic Reactions (Chemical Industries Series), 115, 289-291. Boca Raton, Florida:CRC Press-Taylor & Francis Group. PNNL-SA-49251. Dagle R.A., Y. Wang, G. Xia, J.J. Strohm, J.D. Holladay, and D.R. Palo. 2007. "Selective CO Methanation Catalysts for Fuel Processing Applications." Applied Catalysis. A, General 326, no. 2:213-218. PNWD-SA-7415. Wang Y., and D.L. King. 2007. "Preface." Catalysis Today 120, no. 1:1. PNNL-SA-51157. Chin Y., D.L. King, H. Roh, Y. Wang, and S. Heald. 2006. "Structure and Reactivity Investigations on Supported Bimetallic Au-Ni Catalysts Used for Hydrocarbon Steam Reforming." Journal of Catalysis 244, no. 2:153-162. PNNL-SA-52736. Hu J., G. Xia, J.F. White, T.H. Peterson, and Y. Wang. 2006. "Biphasic Catalytic Oxidation of Hydrocarbons Using Immobilized Homogeneous Catalyst in a Microchannel Reactor." In Catalysis of Organic Reactions. Chemical Industry Series, edited by SR Schmidt, 115, 91-98. Boca Raton, Florida:CRC Press. PNWD-SA-7210. Roh H., A. Platon, Y. Wang, and D.L. King. 2006. "Catalyst Deactivation and Regeneration in Low Temperature Ethanol Steam Reforming with Rh/CeO2-ZrO2 Catalysts." Catalysis Letters 110, no. 1-2:1-6. PNNL-SA-47728. Cao C., Y. Wang, and R.T. Rozmiarek. 2005. "Heterogeneous Reactor Model for Steam Reforming of Methane in a Microchannel Reactor with Microstructured Catalysts." Catalysis Today 110, no. 1-2:92-97. PNWD-SA-6873. Cao C., Y. Wang, J.D. Holladay, E.O. Jones, and D.R. Palo. 2005. "Design of Micro-Scale Fuel Processors Assisted By Numerical Modeling." AIChE Journal 51, no. 3:982-988. PNWD-SA-6403. Chin Y., J. Hu, C. Cao, Y. Gao, and Y. Wang. 2005. "Preparation of a novel structured catalyst based on aligned carbon nanotube arrays for a microchannel Fischer-Tropsch synthesis reactor." Catalysis Today 110, no. 1-2:47-52. PNWD-SA-7010. Frye J.G., A.H. Zacher, T.A. Werpy, and Y. Wang. 2005. "Catalytic Preparation of Pyrrolidones from Renewable Resources." In Catalysis of Organic Reactions, edited by John R. Sowa, Jr. 145-154. Boca Raton, Florida:Taylor and Francis. PNNL-SA-50361. Frye J.G., A.H. Zacher, T.A. Werpy, and Y. Wang. 2005. "Catalytic Preparation of Pyrrolidones from Renewable Resources." In Twentieth Conference on the Catalysis of Organic Reactions 2004 : Hilton Head Island, S.C. Chemical industries, edited by John R. Sowa, Jr., 104, 145-154. Boca Raton, Florida:CRC Press. PNNL-SA-39759. Holladay J.D., E.O. Jones, R.A. Dagle, G. Xia, C. Cao, and Y. Wang. 2005. "Miniaturization of a Hydrogen Plant." In Microreactor Technology and Process Intensification, ACS Symposium Series, edited by Yong Wang and Jamelyn D. Holladay. 162-178. Washington, District Of Columbia:American Chemical Society. PNNL-SA-42455. Jarosch K.P., A.Y. Tonkovich, S.T. Perry, D.J. Kuhlmann, and Y. Wang. 2005. "Microchannel Reactors for Intensifying Gas-to-Liquid Technology." In Microreactor Technology and Process Intensification, ACS Symposium Series, edited by Yong Wang and Jamelyn D. Holladay. 258-272. Washington, District Of Columbia:American Chemical Society. PNWD-SA-7131. Macht J., C.D. Baertsch, M. May-Lozano, S.L. Soled, Y. Wang, and E. Iglesia. 2005. "Support Effects on Bronsted acid site densities and alcohol dehydration turnover rates on tungsten oxide domains." Journal of Catalysis 227. PNNL-SA-44026. Tonkovich A.Y., and Y. Wang. 2005. "Overview of Early-Stage Microchannel Reactor Development at Pacific Northwest National Laboratory." In Microreactor Technology and Process Intensification, ACS Symposium Series, edited by Yong Wang and Jamelyn D. Holladay. 47-65. Washington, District Of Columbia:American Chemical Society. PNWD-SA-7125. Wang Y., B.R. Johnson, C. Cao, Y. Chin, R.T. Rozmiarek, Y. Gao, and A.Y. Tonkovich. 2005. "Engineered Catalysts for Microchannel Reactor Applications." In Microreactor Technology and Process Intensification, ACS Symposium Series, edited by Yong Wang and Jamelyn D. Holladay. 102-118. Washington, District Of Columbia:American Chemical Society. PNWD-SA-7130. Xia G., J.D. Holladay, R.A. Dagle, E.O. Jones, and Y. Wang. 2005. "Development of Highly Active Pd-ZnO/Al2O3 Catalysts for Microscale Fuel Processor Applications." Chemical Engineering and Technology 28, no. 4:515-519. PNWD-SA-6815. Cao C., G. Xia, J.D. Holladay, E.O. Jones, and Y. Wang. 2004. "Kinetic Studies of Methanol Steam Reforming Over Pd/ZnO Catalyst Using a Microchannel Reactor." Applied Catalysis. A, General 262, no. 1:19-29. PNWD-SA-6164. Holladay J.D., E.O. Jones, R.A. Dagle, G. Xia, C. Cao, and Y. Wang. 2004. "High Efficiency and Low Carbon Monoxide Micro-scale Methanol Processors." Journal of Power Sources 131, no. 1-2:69-72. PNWD-SA-6285. Holladay J.D., Y. Wang, and E.O. Jones. 2004. "Review of Developments in Portable Hydrogen Production Using Microreactor Technology." Chemical Reviews 104, no. 10:4767-4789. PNWD-SA-6349. Tonkovich A.L., S. Perry, Y. Wang, D. Qiu, T.J. LaPlante, T.J. LaPlante, and W.A. Rogers. 2004. "Microchannel Process Technology for Compact Methane Steam Reforming." Chemical Engineering Science 59, no. 22-23:4819-4824. PNNL-SA-44031. Wang Y., Y. Chin, R.T. Rozmiarek, B.R. Johnson, Y. Gao, J.M. Watson, and A.Y. Tonkovich, et al. 2004. "Highly Active and Stable Rh/MgO-AI2O3 Catalysts for Methane Steam Reforming." Catalysis Today 98, no. 4:575-581. PNNL-SA-43442. Holladay J.D., E.O. Jones, D.R. Palo, M.R. Phelps, Y. Chin, R.A. Dagle, and J. Hu, et al. 2003. "Miniature Fuel Processors for Portable Fuel Cell Power Supplies." In Solid State Ionics--2002 : Symposium held December 2-5, 2002, Boston, Massachusetts, U.S.A. / Materials Research Society Symposium Proceedings, edited by Philippe Knauth and Hubert A. Gasteiger, 756, 429-434. Warrendale, Pennsylvania:Materials Research Society. PNWD-SA-5862. Hu J., Y. Wang, D.P. Vanderwiel, Y. Chin, D.R. Palo, R.T. Rozmiarek, and R.A. Dagle, et al. 2003. "Fuel Processing for Portable Power Applications." Chemical Engineering Journal 93, no. 1:55-60. PNWD-SA-5432. Chin Y., R.A. Dagle, J. Hu, A. Dohnalkova, and Y. Wang. 2002. "Steam Reforming of Methanol Over Highly Active Pd/ZnO Catalyst." Catalysis Today 77 (1-2), no. DEC 1 2002:79-88. PNWD-SA-5948. Chin Y., R.A. Dagle, J. Hu, A. Dohnalkova, and Y. Wang. 2002. "Steam Reforming of Methanol over Highly Active Pd/ZnO Catalyst." Catalysis Today 77, no. 1-2:79-88. PNWD-SA-5685. Hu J., Y. Wang, Y. Chin, D.R. Palo, J.D. Holladay, R.T. Rozmiarek, and R.A. Dagle, et al. 2002. "Catalytic Hydrogen Production for Small Portable Power Applications." In ACS Annual Meeting, Fuel Chemistry Division Preprints, Boston, Massachusetts, 47, 725-726. Washington Dc:American Chemical Society. PNWD-SA-5662. Palo D.R., J.D. Holladay, R.T. Rozmiarek, C.E. Guzman-Leong, Y. Wang, J. Hu, and Y. Chin, et al. 2002. "Development of a Soldier-Portable Fuel Cell Power System, Part I: A Bread-Board Methanol Fuel Processor." Journal of Power Sources 108, no. 1-2:28-34. PNWD-SA-5518. Palo D.R., J.D. Holladay, R.T. Rozmiarek, C.E. Guzman-Leong, Y. Wang, J. Hu, and Y. Chin, et al. 2002. "Fuel Processor Development for a Soldier-Portable Fuel Cell System." In Microreaction Technology, IMRET 5: Proceedings of the Fifth International Conference on Microreaction Technology, edited by M. Matlosz, W. Ehrfeld, J.P. Baselt, 359-367. Berlin, :Springer-Verlag. PNWD-SA-5297. Wang Y., C.H. Peden, and S. Choi. 2001. "Preparation of Highly Dispersed Cs-Tungstophosphoric Acid Salt on MCM-41 Silica." Catalysis Letters 75, no. 3-4:169-173. PNNL-SA-34769. Elliott D.C., S.W. Fitzpatrick, J.J. Bozell, J.L. Jarnefeld, R.J. Bilski, L. Moens, and J.G. Frye, et al. 2000. "Production of Levulinic Acid and Use as a Platform Chemical for Derived Products." In Biomass, a Growth of Opportunity in Green Energy and Value-Added Products: Proceedings of the 4th Biomass Conference of the Americas, 1, 595-600. Oxford:Elsevier Science. PNNL-SA-30900. Liu J., G.E. Fryxell, M. Qian, L.Q. Wang, and Y. Wang. 2000. "Interfacial Chemistry in Self-Assembled Nanoscale Materials with Structural Ordering." Pure and Applied Chemistry 72, no. 1-2:269-279. PNNL-SA-34255. Marco J.L., A.Y. Tonkovich, M.J. Lamont, S.P. Fitzgerald, D.P. VanderWiel, Y. Wang, and R.S. Wegeng. 2000. "Compact Microchannel Fuel Vaporizer for Automotive Applications." In IMRET 4: 4th International Conference on Microreaction Technology, Topical Conference Proceedings. AIChE Spring National Meeting March 5-9, 2000 Atlanta, GA, 301-307. New York, New York:AIChE. PNNL-SA-31701. Tonkovich A.Y., S.P. Fitzgerald, J.L. Zilka, M.J. Lamont, Y. Wang, D.P. VanderWiel, and R.S. Wegeng. 2000. "Microchannel Chemical Reactors for Fuel Processing Applications. II. Compact Fuel Vaporization." In Microreaction technology : industrial prospects : IMRET 3 : proceedings of the Third International Conference on Microreaction Technology, edited by Wolfgang Ehrfeld, 364-371. New York, New York:Springer. PNNL-SA-31176-A. VanderWiel D.P., J.L. Zilka, Y. Wang, A.Y. Tonkovich, and R.S. Wegeng. 2000. "Carbon Dioxide Conversions in Microreactors." In IMRET 4: Proceedings of the 4th International Conference on Microreaction Technology, Topical Conference Proceedings, AIChE Spring National Meeting, March 5-9, 2000 Atlanta, GA., 187-193. New York, New York:American Institute of Chemical Engineers. PNNL-SA-31702. Tonkovich A.Y., J.L. Zilka, M.J. Lamont, Y. Wang, and R.S. Wegeng. 1999. "Microchannel Reactors for Fuel Processing Applications. I. Water Gas Shift Reactor." Chemical Engineering Science 54, no. 13-14:2947-2951. PNNL-SA-31169. Tonkovich A.Y., J.L. Zilka, M.J. Lamont, Y. Wang, and R.S. Wegeng. 1998. "Microchannel Reactors for Fuel Processing Applications I. Water Gas Shift Reactor." In Proceedings of the 15th International Symposium on Chemical Reaction Engineering, published in Chemical Engineering Science, 54, 2947-2951. PNNL-SA-31169. C. Carrillo, H.F. Xiong, A.T DeLaRiva, D. Kunwar, E.J. Peterson, S.R. Challa, G.S. Qi, S. Oh, M.H.Wiebenga, X.I.P. Hernandez, Y. Wang, A.K. Datye, “Designing Catalysts for Meeting the DOE 150�° Challenge for Exhaust Emissions”, Microsc. Microanal., 2017, 23, 2028-2029, DOI: 10.1017/S1431927617010807. A.J. R. Hensley, C.Wöckel, C.Gleichweit, K.Gotterbarm, C.Papp,H.Steinrück, Y.Wang, R.Denecke, and J.S.McEwen, “Identifying the Thermal Decomposition Mechanism of Guaiacol on Pt(111): An Integrated X ray Photoelectron Spectroscopy and Density Functional Theory Study”, J.Phy.Chem.C., 2017, DOI: 10.1021/acs.jpcc.7b10006. B.Lin, Y.Guo, J.Lin, J.Ni, J.Lin, L.Jiang, Y.Wang, “Deactivation study of carbon-supported ruthenium catalyst with potassium promoter”, Appl.Catal.A: General, 2017, 541, 1-7, DOI: 10.1016/j.apcata.2017.04.020. F.Bossola, X.I.Pereira-Hernandez, C.Evangelisti, Y.Wang, and V.Dal Santo, ”Investigation of the promoting effect of Mn on a Pt/C catalyst for the steam and aquesous phase reforming of glycerol”, J.Catal., 2017, DOI: 10.1016/j.jcat.2017.03.002. J.Chen, J.Sun, Y.Wang, “Catalysts for steam reforming of bio-oil: a review”, Ind.Eng.Chem.Res., 2017, DOI: 10.1021/acs.iecr.7b00600. J.Tian, Y.Ke, G.Kong, M.Tan, Y.Wang, J.Lin, W.Zhou, S.Wan, “A novel structured PdZnAl/C fiber catalyst for methanol steam reforming in microreactor“, Renewable Energy, 2017, 113, 30-42, DOI: 10.1016/j.renene.2017.04.070. J.Zhang, B.An, Y.Hong, Y.Meng, X.Hu, C.Wang, J.Lin, W.Lin and Y.Wang, “Pyrolysis of metal–organic frameworks to hierarchical porous Cu/Zn-nanoparticle@carbon materials for efficient CO2 hydrogenation”, Materials Chemistry Frontiers, 2017, DOI: 10.1039/C7QM00328E. L.Du, C.Du, G.Chen, F.Kong, G.Yin, Y.Wang, “Metal-organic coordination newworks: Prussian Blue and its synergy with Pt Nanoparticles to enhance oxygen reduction kinetics”, ACS Appl. Mater. Interfaces, 2016, 8(24), 15250-15257, DOI: 10.1021/acsami.6b02630. L.Zhang, G.Kong, H.Yang, L.Zhang, S.Wan, J.Lin, and Y.Wang, “Direct coupling of thermo- and photo-catalytic conversion of CO2-H2O to fuels”, ChemSusChem, 2017, DOI: 10.1002/cssc.201701472. N.Jaeger, Y.Wang, J.Hu, “Development and application of in situ high temperature, high pressure magic-angle spinning NMR”, in Modern Magnetic Resonance, 2nd Ed., 2017, DOI: 10.1007/978-3-319-28275-6_93-1. N.R.Jaegers, C.Wan, M.Y.Hu, M.Y.Hu, M.Vailiu, D.A.Dixon, E.Walter, I.E.Wachs, Y.Wang, J.Hu, “Investigation of silica-supported vanadium oxide catalysts by high field 51V magic-angle spinning NMR”, J.Phy.Chem.C., 2017, DOI: 10.1021/acs.jpcc.7b01658. W.Hu, Y.Wan, L.Zhu, X.Cheng, S.Wan, J.Lin, and Y.Wang, “A Strategy for Simultaneous Synthesis of Methallyl Alcohol and Diethyl Acetal with Sn-�2”, ChemSusChem, 2017, DOI: 10.1002/cssc.201701435. W.Li, L.Kovarik, Y.Cheng, L.Nie, M.Bowden, J.Liu, Y.Wang, “Stabilization and transformation of Pt nanocrystals supported on ZnAl2O4 spinel”, RSC Advances, 2017, DOI: 10.1039/C6RA26159K. X.Wang, Z.Lan, Y.Liu, Y.Luo, J.Chen, L.Jiang, Y.Wang, “Facile fabrication of hollow tubular mixed oxides for selective catalytic reduction of NOx at low temperature: a combined experimental and theoretical study”, Chem.Comm., 2017, 53, 967-970, DOI: 10.1039/C6CC08137A. Y.Hong, S.Zhang, F.Tao, Y.Wang, “Stabilization of iron-based catalysts against oxidation: an in situ ambient pressure XPS study”, ACS Catalysis, 2017, DOI: 10.1021/acscatal.7b00636. Y.Wan, M.Zhuang, S.Chen, W.Hu, J.Sun, J.Lin, S.Wan, Y.Wang, “One-pot production of lactic acid from acetol over dealuminated Sn-beta supported gold catalyst”, ACS Catalysis, 2017, DOI: 10.1021/acscatal.7b01499. J.Cao, J.Hu, S.Li, C.Chin, W.Wilcox, and Y.Wang “Intensified Fischer-Tropsch Synthesis Process Using Microchannel Catalytic Reactors,” Catal.Today 140 (2009) 149-156. J.D.Holladay, J.Hu, D.L.King, Y.Wang, “An overview of hydrogen production technologies”, Catal.Today 139 (2009) 244-260. J.Lee, D.Lee, K.Y.Lee, and Y.Wang, “Cr-free Fe-based metal oxide catalysts for high temperature water gas shift reaction of fuel processor using LPG”, Catal.Today 146 (1-2) (2009) 260-264. W.Liu, J.Hu, and Y.Wang “Tailoring of Fischer-Tropsch Product Distributions Using a Monolithic Reactor”, Catalysis Today. 140 (2009) 142-148. Y.Shao, J.Liu, Y.Wang, Y.Lin, “Novel Catalyst Support Materials for PEM Fuel Cells: Current Status and Future Prospects”, J.Mater.Chem. 19 (1) (2009) 46-59. Y.Shao, J.Wang, R.Kou, J.Liu, Y.Wang, Y.Lin. “The durability dependence of Pt/CNT electrocatalysts on the nanostructures of carbon nanotubes: hollow- and bamboo-CNTs”, J. Nanoscience and Nanotechnology 9 (10) (2009) 5811-5815. Y.Shao, J.Wang, R.Kou, M.Engelhard, J.Liu, Y.Wang, Y.Lin. “The corrosion of PEM fuel cell catalyst supports and its implications for developing durable catalysts”, Electrochimica Acta 54 (11) (2009) 3109-3114.